For the first time ever, the U.S. Congress has a Full Employment Caucus. At a January 29 news conference, Representative John Conyers, Jr., Ranking Member of the Committee on the Judiciary, announced that 17 members of the House of Representatives have decided to work together as a caucus to secure the human right to living-wage employment. An initial focus of the caucus is HR 1000, the Humphrey-Hawkins Full Employment and Training Act, which was introduced earlier this year by Conyers and already has 57 co-sponsors. The Machinists Union filmed the event, indicating the possibility of increased labor involvement on the issue. The bill establishes a trust fund financed by a small tax on Wall Street trading that will distribute funds to States, local governments, and Indian tribes to hire public-service workers to meet pressing social and environmental needs. In a January 30 conference call with the community-based Jobs for All Campaign, ten activists from various parts of the country talked with Jenny Perrino, Conyers staff person on the issue, about building toward a “Full Employment Action Day” on Capitol Hill in late May or early June. A planning committee meeting for that event is projected for late March. On February 5 in Washington, DC, Conyers will be discussing HR 1000 at a public forum on “Employment: A Human Right.” Also speaking will be Representative Frederica S. Wilson, a co-sponsor, and a panel of economists: Dean Baker, Co-Director and Co-Founder of Center for Economic and Policy Research; John Cavanagh, Director of the Institute for Policy Studies; Phil Harvey, Professor of Law and Economics at Rutgers University; Thea Lee, Deputy Chief of Staff at AFL-CIO; and Larry Mishel, President of Economic Policy Institute. Hopefully, the economists at that forum will articulate clear support for true full employment, rather than one or another arbitrary unemployment rate. Unfortunately, the term “full employment” has become ambiguous. Many economists use the term to refer to an unemployment rate that is supposedly not so low as to cause excessive inflation, which they call the nonaccelerating inflation rate of unemployment, or NAIRU. They disagree about what that specific rate is supposed to be and recent consensus predictions have been wrong. But many of them accept that there is such a rate, though it may well be a myth. Regardless, even if true full employment generated inflationary pressures, given the political will, we could deal with it without creating unemployment and poverty to do so. HR 1000 articulates what had been, until recently, the common sense definition of “full employment.” We will have full employment when everyone who is able and willing to work can find a job. In the following letter that I sent to the panelists on February 1, I ask them to help clarify this ambiguity and fully support HR 1000 and its definition of full employment. As economists with considerable standing in progressive communities, at the February 5 forum on “Employment: A Human Right” you will be in a position to offer valuable support for true full employment, in contrast to one NAIRU or another. When more economists affirm an unambiguous definition of full employment, it will strengthen grassroots efforts to use HR 1000 as an organizing tool. • Do you support the human right to a living-wage job opportunity? • Do you believe that if we have the political will, we can handle any inflationary pressures that result from securing the human right to a living-wage job opportunity? • The right to full opportunities for useful paid employment at fair rates of compensation of all individuals able, willing, and seeking to work. • Achieving a national goal of jobs for all at living wages. • Even at the top of the business cycle, when national unemployment rates drop to the 4 percent to 5 percent range, job vacancy surveys show that the economy does not provide enough jobs to employ everyone who wants to work. • The right to useful work at living wages for all persons seeking employment. But as you know, “full employment” has become an ambiguous phrase. Many economists use the term to refer to a NAIRU. They disagree about what that specific rate is supposed to be and recent consensus predictions have been wrong. But most of them seem to accept that there is such a rate, though it may well be a myth. Referring to traditional measures to stimulate the private economy, in an email to me Dean Baker said, “There will be a limit as to how far you can go with just macroeconomic policy. At that point there will still be people without jobs. It will require other policies to get those people employed.” In Getting Back to Full Employment, Baker and his co-author, Jared Bernstein, argue that the government should act as an “employer of last resort” when “labor markets fail to create the quantity of jobs necessary to employ American labor resources.” HR 1000 fulfills that responsibility. Concerning inflation, the bill states, “Direct job creation to close the economy’s job gap … provides a means of creating additional jobs without adding significantly to inflationary pressures,” as can be the case with deficit spending. First, unlike a macroeconomic stimulus, a direct job creation program can limit its job creation effect to those places where job shortages still exist and for the benefit of those individuals who lack work because of the unavailability of suitable employment in the regular labor market. Second, unlike the jobs created by a macroeconomic stimulus, workers employed in a direct job creation program can remain available for private sector employment when and if they are needed, thereby accomplishing the wage and price stabilizing function that unemployment performs without requiring anyone to be unemployed. Third, while a macroeconomic stimulus creates jobs by increasing aggregate demand, thereby exerting upward pressure on prices, a direct job creation program can be funded without increasing aggregate demand at the top of the business cycle (as the countercyclical trust fund financing of Unemployment Insurance benefits demonstrates)…. Jobs funded by HR 1000 would have to be temporary … by making workers employed with program funds subject to the same kind of recall requirements that limit the continued receipt of Unemployment Insurance benefits…. [HR 1000] would protect program employees from having to accept private or regular public sector jobs less favorable than their program job. So, in today’s economy with intense global competition, the conventional concerns about inflation strike me as unjustified, especially since HR 1000 includes a number of provisions to guard against excessive inflation. Regardless, even if true full employment generated inflationary pressures, given the political will we could deal with that issue – without creating unemployment and poverty to do so. Clearly, achieving full employment is possible in this country. We did it during World War Two because we made a commitment to do it. We can do it again. A standard justification for accepting less than full living-wage employment is that young and relatively unskilled workers don’t deserve a living wage. Therefore, the argument goes, they must work hard, gain experience, and improve their skills so they can boost their income. Thus, poverty-level wages are supposed to serve as a motivational tool for self-advancement and enhanced productivity. But workers employed at a living wage are still motivated to improve their position. And declaring that some people don’t deserve a living wage is a moral outrage and opens the door to evermore people working at poverty-level wages. A living wage is a fundamental human right that all workers deserve. We must consistently fight for that principle. As George Lakoff has argued persuasively, we need to couch our policy proposals within a moral framework that resonates deeply with our audience. And most Americans agree: the federal government should see to it that everyone who wants to work can find a living wage job. Achieving true full employment would have enormous beneficial effects throughout our society. So hopefully at the Feb. 5 forum you will offer clear, strong support for the human right to living-wage employment. Congressman Conyers has posted a summary of HR 1000. To read the full text, click here. On Twitter you can stay in touch by following @LivingWageJobs. 1. Have you found people with a similar vision as yours? 2. Have you created a rapid prototype of your project. If so, what is it? If not, what might a rapid prototype be? 3. If you have created a rapid prototype of the project with collaborators, have you and some of these people created a next iteration of the project? 4. Are you helping satisfying individual needs? 5. Are you finding ways for individual passions to flower? 6. Have you created feedback loops so that you can find out how prototypes and iterations of your project has landed? If so, what are those feedback loops? If no,t what might they be? 7. Have you created a process that enables users of your project to co-develop the next iterations of it with you? If so, what is this process? If not, what might this process be? 8. Have you enabled a process which allows people to play multiple roles? 9. How well have you connected people with each other? 10. Have you created a safe space where people can listen and empathize with each other? 11. Do you have a facilitated discussion process that allows everyone to participate in the discussion? Core project people as well as more peripheral people. 12. Do you have facilitated discussion processes which allow a diversity of opinions and belief systems to be expressed? 13. Do you have a facilitated discussion processes which can assess, synthesize and integrate different choices, viewpoints, and opinions? 14. Has your project facilitated autonomous groups to form? If not how might you facilitate these groups to form in your project? 15. Have you created a way for outsiders to become participants in your project? 16. Have you created a gradation scale of ways people can become more and more involved in your project? If so, what are these gradation of steps? If not, what might the steps be? 17. Do you have sandboxes where people can experiment around with parts of the project without fear of failure? 18. Do you have a way of incubating new ideas and projects? If not, how might you encourage that in your project? 19. Do you have metrics with which everyone can track to measure progress in the project? 20. Have you created a platform where people can constantly communicate with each other? What does this platform look like? 21. Have you created a culture that inspires people to communicate more compassionately and non-violently? 22. Are you using restorative justice rather than punishment in your group? What does this process look like for your project? 23. Are you creating a shared pool of resources that everyone can tap into? 24. Are you creating non-owned products and services? 25. Do you have ways that can allow people to gift? If not, how might you do so? 26. Are people listening to what the collective field is asking to emerge? After receiving an invitation from Phil Harvey to participate in the January 30 conference call with the Jobs for All Campaign, I sent the following email to Logan Martinez, who distributed the notice. The first item on the agenda is how to build support for HR 1000, the Humphrey-Hawkins Full Employment and Training Act, which was introduced by Representative John Conyers, Jr and has 56 co-sponsors. Phil Harvey informed me about the Thursday conference call. I very much look forward to it and hope to help with the Jobs for All Campaign in whatever way I can, especially with regard to HR 1000. As economists with considerable standing in progressive communities,… you are in position to offer the kind of support for HR 1000 … that grassroots activists need in order to build support for that legislation. I therefore hope that you will not only support HR 1000, but also affirm the two principles – one moral, the other practical – that, it seems to me, underlie that legislation. • Do you support HR 1000, the Humphrey-Hawkins Full Employment and Training Act? I’m not sure that this approach, especially the proposed SurveyMonkey questionnaire, “Full Employment: A Survey for Economists,” is a good idea, so I welcome feedback, especially recommendations that I hold off on it or suggestions for how to improve it. If folks have a chance to offer me feedback during or after the call, I will appreciate it. But your agenda looks full, so if that is not feasible, I will certainly understand and still remain available to contribute in other ways. BTW, as a personal intro, I am the recent author of the Guarantee Living-Wage Job Opportunities petition. In 1989, I initiated the Solutions to Poverty Workshop, which led to the San Francisco Antipoverty Congress and the Campaign to Abolish Poverty (CAP), and in 1996 I self-published Economic Security for All: How to End Poverty in the United States. I very much appreciate your excellent work and look forward to collaborating. Earlier today, I sent the following to Justin Talbot Zorn, Dean Baker, Karen Dolan, and Phil Harvey. Your feedback is welcome. Party in order to promote the Feb. 5 forum, I may post and circulate these documents Thursday, Jan. 30, no sooner than 6pm Eastern Time. Your feedback would be very much appreciated. The bill establishes a trust fund financed by a small tax on Wall Street trading. Those funds will be distributed to States, local governments, and Indian tribes to hire public-service workers to meet pressing social and environmental needs. • Progress to fulfill the right to useful work at living wages for all persons seeking employment. But “full employment” has become an ambiguous phrase. Many economists use the term to refer to an unemployment rate that is supposedly not so low as to cause excessive inflation, which they call the nonaccelerating inflation rate of unemployment, or “NAIRU.” They disagree about what that specific rate is supposed to be and recent expert predictions have been wrong. But most of them seem to accept that there is such a rate. These concerns have prompted many economists to avoid offering clear, full-throated support for true full employment, as affirmed in HR 1000. It will be interesting, therefore, to see if the five economists on the February 5 panel will clearly endorse HR 1000, which does not get sucked into this academic debate about the NAIRU (which may well be a myth). Grassroots activists, such as the 130 individuals who’ve signed the Guarantee Living-Wage Job Opportunities petition, need economists to endorse HR 1000 and its unambiguous definition of full employment. This endorsement will help give this legislation legitimacy, which will strengthen our efforts to use the bill as an organizing tool. So I’ve also posted “Full Employment: A Survey for Economists” and hope that economists will complete this questionnaire to clarify their position on these issues. It will be helpful for any economists who don’t support true full employment to let us know why. Perhaps there are legitimate objections to HR 1000 that those of us who back it need to know about. So please inform economists about this survey and suggest to them they complete it. I will share responses, as well as a summary report. Especially in today’s economy, the concerns about inflation strike me as unjustified, and HR 1000 includes a number of provisions to guard against excessive inflation. Given the political will, rooted in strong popular pressure, we could deal with any problematic increases in inflation, as I argued in the “Controlling Inflation” section of my 1990 book, Economic Security for All. A standard justification for accepting less than full living-wage employment is that young and relatively unskilled workers don’t deserve a living wage. Therefore, the argument goes, they must work hard, gain experience, and improve their skills so they can boost their income. Thus, poverty-level wages are supposed to serve as a motivational tool for self-advancement and enhanced productivity. But workers employed at a living wage are still be motivated to improve their position. And declaring that some people don’t deserve a living wage opens the door to evermore people working at poverty-level wages. A living wage is a fundamental human right that all workers deserve. We must consistently fight for that principle. 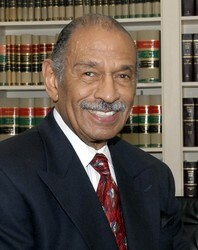 Rep. John Conyers. Jr. introduced HR 1000 in March 2013. Thus far, it has garnered 56 cosponsors, including Representative Frederica S. Wilson. Conyers and Wilson will be the featured speakers at the one-hour Feb. 5 public forum. Participating on a panel will be: Dean Baker, Co-Director and Co-Founder of Center for Economic and Policy Research; John Cavanagh, Director of the Institute for Policy Studies; Phil Harvey, Professor of Law and Economics at Rutgers University; Thea Lee, Deputy Chief of Staff at AFL-CIO; Larry Mishel, President of Economic Policy Institute. Spread the word about the forum and attend if you can. Achieving true full employment would have enormous beneficial effects throughout our society. When more economists take a clear stand on this moral issue, our chances of success will be enhanced. So hopefully the Feb. 5 event will lead to more support from economists for HR 1000 and the human right to living-wage employment. I’ll inform signers of the Guarantee Living-Wage Job Opportunities petition about developments concerning this urgent issue. If you have not already signed, please consider doing so. Do you support HR 1000, the Humphrey-Hawkins Full Employment and Training Act? Do you support the human right to a living-wage job opportunity? Do you believe that if we have the political will, we can handle any inflationary pressures that result from securing the human right to a living-wage job opportunity? 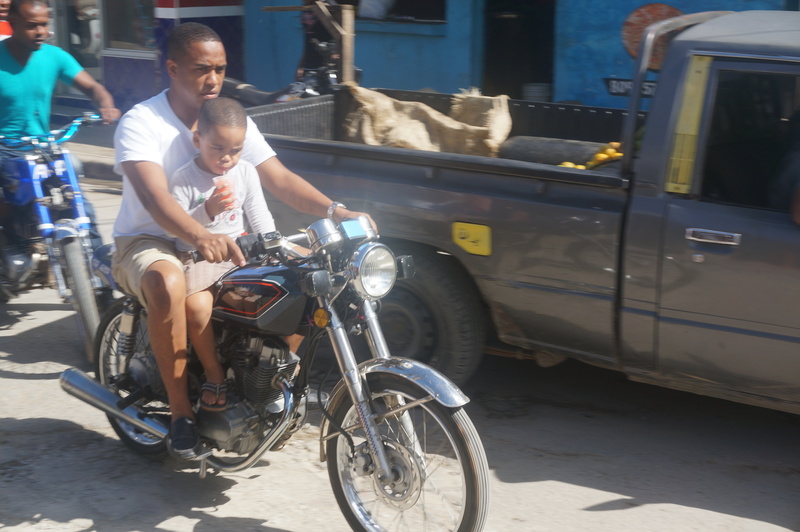 Today I returned to the mountains 90 minutes from Las Terrenas looking for the wonderful Martinez family who hosted me in 1988. I only had their names and the name of the nearest town. I drove up into the mountains to the general area they had lived, as I remembered it, and stopped at the first store. 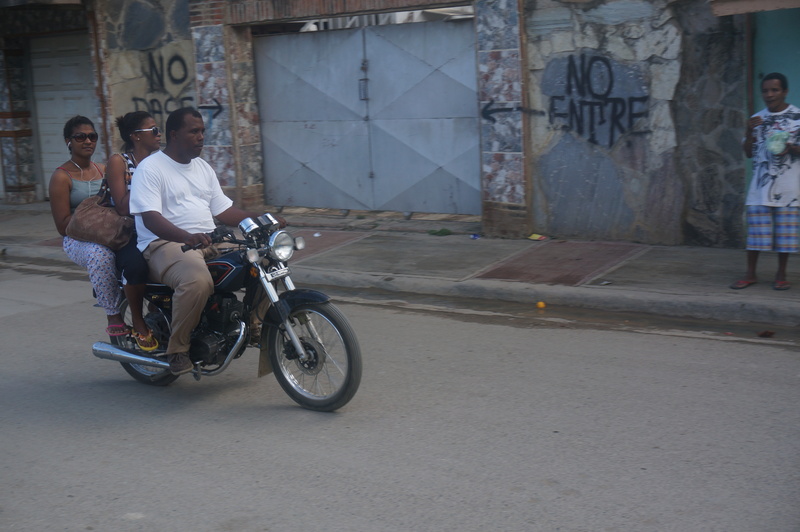 I asked the people there, in Spanish, “Do you know Pedro and Victoria Martinez. They had nine girls.” After two or three minutes, they told me to go talk to a man at a nearby store. 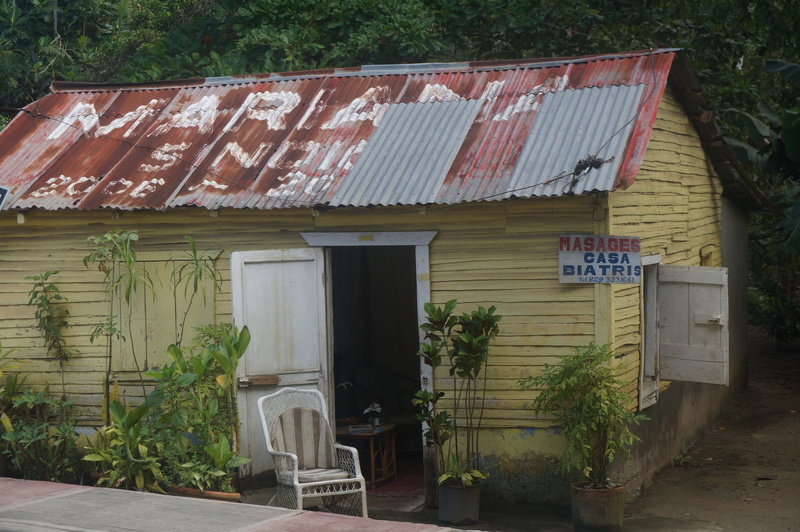 I paid someone to take me to that store, the owner of which turned out to be married to one of the Martinez girls. I then paid someone to take me to their house, which was only 200 yards down the road. Victoria remembered me and gave me an extremely warm welcome. When her husband arrived, the good times continued. Victoria then called one of her daughters, Susanah, who soon joined us and the conversation continued. When I told Susanah I was writing my autobiography, she immediately replied, “That’s great. That’s how we learn to do better with our lives — by reading about other people’s lives.” I told them that I had really appreciated their hospitality in 1988 and have wanted to return ever since. 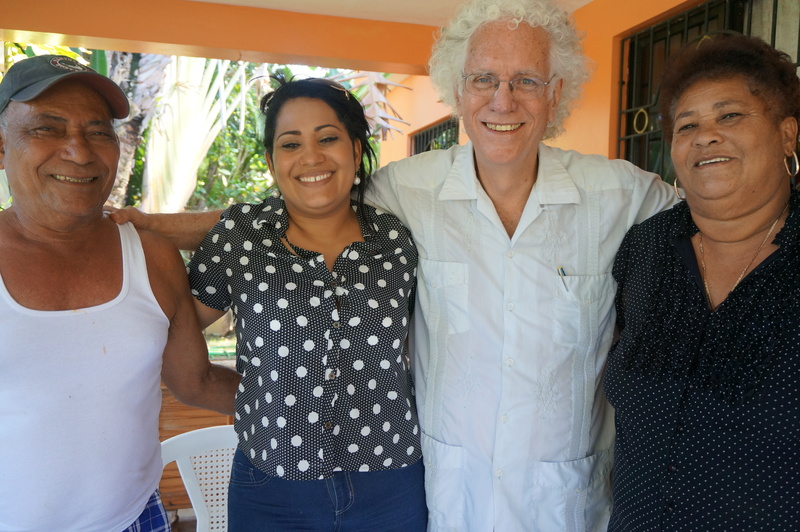 After I left, glowing from the marvelous visit and the beautiful spirit of the Martinez family, I felt gratified that my experience in 1988 and my memory of that experience was not a mirage. They really are a wonderful family. One memory was wrong, however. They only had seven daughters, not nine. My plan is to post a questionnaire like the following on Survey Monkey and widely circulate an invitation for people to complete it. The intent is to find and connect with others who share an interest in what I tentatively, for lack of a better word for now, call “holistic organizing.” The basic idea is to nurture the development of supportive communities whose members support each other in their self-development, their efforts to grow alternative communities that can serve as “models” for the future, and their political efforts to help improve public policies. I may begin distributing this Wednesday, January 29. If you have any suggested changes or words of encouragement, that would be appreciated. And if you think it’s a bad idea, please let me know that as well. This 14-question survey is intended to explore attitudes and activities concerning personal growth, community development, and political action. The questions only ask for yes-or-no answers. Completing the survey will probably take less than five minutes. Responses will be kept anonymous unless otherwise indicated. A report on the results will be shared with all respondents who ask to receive it. Respondents will be invited to participate in an online discussion and/or video call about the results. • And consider how to improve governmental policies and social institutions? If you do not have those kind of close friends, would you like to? If you do have those kind of close friends, do you occasionally gather as a group to engage in those kind of activities together? In the last month, have you, in one way or another, tried to become a better human being? During the next month, do you plan to try to become a better human being? In the last month, have you tried to help improve a social institution (or organization), such as a spiritual community, your child’s school, a neighborhood center, or an informal community of friends? 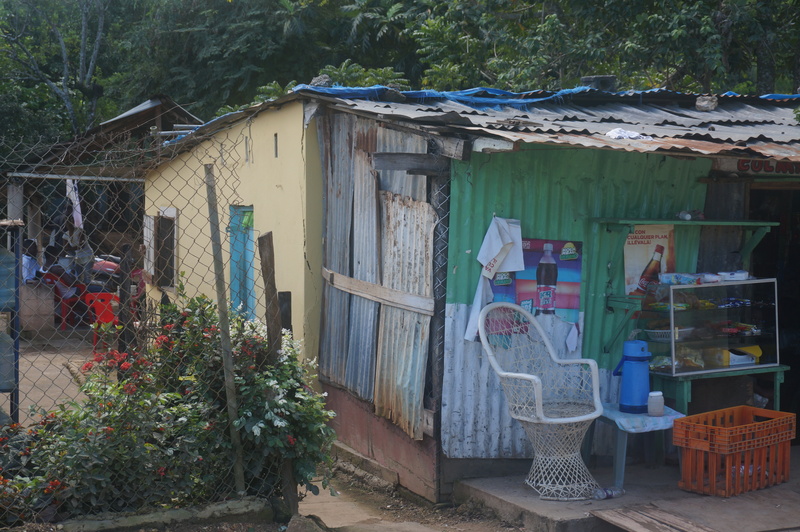 During the next month, do you plan to help improve a social institution or informal community? In the last month, have you engaged in an effort to impact public policy? During the next month, do you plan to engage in an effort to impact public policy? Would you be interested in participating in an online discussion and/or a video call about these questions with others who answer this survey? If you don’t already, would you like to gather at least once a month with close, trusted friends to share a meal, socialize informally, and hear what others have to say about the kind of questions posed in this survey? Will you tell others about this survey? May we identify you as the author of your comments? Would you like to receive a report on the results of this survey? 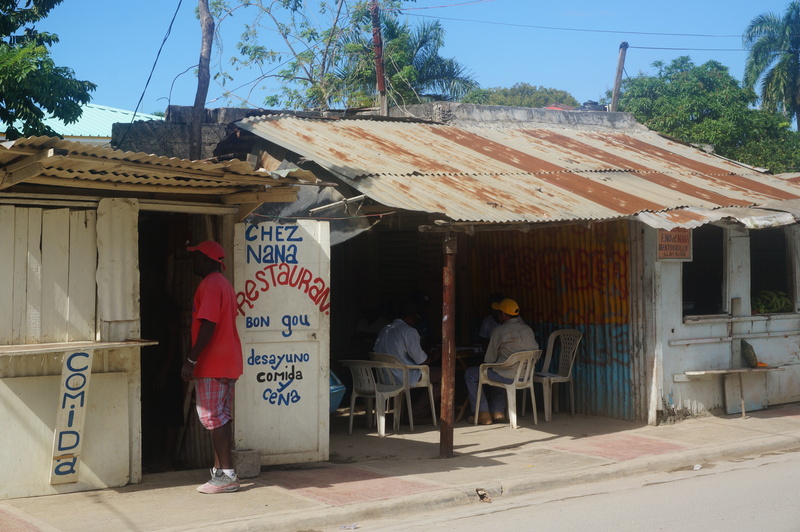 These six photos reflect the poverty that afflicts the Dominican Republic, even in the relatively prosperous tourist town of Las Terrenas. When Thoreau died in 1862, Emerson was a national figure, the Great American Philosopher. Thoreau was a minor, local personality. Emerson’s funeral oration … give[s] his views, positive and negative, of this one-time disciple who has now eclipsed him in stature. His interest in the flower or the bird lay very deep in his mind, was connected with Nature, — and the meaning of Nature was never attempted to be defined by him. He would not offer a memoir of his observations to the Natural History Society. “Why should I? To detach the description from its connections in my mind would make it no longer true or valuable to me: and they do not wish what belongs to it.” His power of observation seemed to indicate additional senses. He saw as with microscope, heard as with ear-trumpet, and his memory was a photographic register of all he saw and heard. And yet none knew better than he that it is not the fact that imports, but the impression or effect of the fact on your mind. Every fact lay in glory in his mind, a type of the order and beauty of the whole. His determination on Natural History was organic. He confessed that he sometimes felt like a hound or a panther, and, if born among Indians, would have been a fell hunter. But, restrained by his Massachusetts culture he played out the game in this mild form of botany and ichthyology. His intimacy with animals suggested what Thomas Fuller records of Butler the apiologist,(2) that “either he had told the bees things or the bees had told him.” Snakes coiled round his leg; the fishes swam into his hand, and he took them out of the water; he pulled the woodchuck out of its hole by the tail, and took the foxes under his protection from the hunters. Our naturalist had perfect magnanimity; he had no secrets; he would carry you to the heron’s haunt, or even to his most prized botanical swamp, — possibly knowing that you could never find it again, yet willing to take his risks. No college ever offered him a diploma,(3) or a professor’s chair; no academy made him its corresponding secretary, its discoverer, or even its member. Perhaps these learned bodies feared the satire of his presence. Yet so much knowledge of Nature’s secret and genius few others possessed, none in a more large and religious synthesis. For not a particle of respect had he to the opinions of any man or body of men, but homage solely to the truth itself; and as he discovered everywhere among doctors some leaning of courtesy, it discredited them. He grew to be revered and admired by his townsmen, who had at first known him only as an oddity. The farmers who employed him as a surveyor soon discovered his rare accuracy and skill, his knowledge of their lands, of trees, of birds, of Indian remains, and the like, which enabled him to tell every farmer more than he knew before of his own farm; so that he began to feel as if Mr. Thoreau had better rights in his land than he. They felt, too, the superiority of the character which addressed all men with a native authority. Indian relics abound in Corcord, — arrow-heads, stone chisels, pestles, and fragments of pottery; and on the river-bank, large heaps of clam-shells and ashes mark spots which the savages frequented. These, and every circumstance touching the Indian, were important in his eyes. His visits to Maine were chiefly for love of the Indian. He had the satisfaction of seeing the manufacture of the bark-canoe, as well as of trying his hand in its management on the rapids. He was inquisitive about the making of the stone arrow-head, and in his last days charged a youth setting out for the Rocky Mountains to find an Indian who could tell him that: “It was well worth a visit to California to learn it.” Occasionally, a small party of Penobscot Indians would visit Concord, and pitch their tents for a few weeks in summer on the river-bank. He failed not to make acquaintance with the best of them; though he well knew that asking questions of Indians is like catechizing beavers and rabbits. In his last visit to Maine he had great satisfaction from Joseph Polis,(4) an intelligent Indian of Oldtown, who was his guide for some weeks. Thoreau was sincerity itself, and might fortify the convictions of prophets in the ethical laws by his holy living. It was an affirmative experience which refused to be set aside. A truth-speaker he, capable of the most deep and strict conversation; a physician to the wounds of any soul; a friend, knowing not only the secret of friendship, but almost worshipped by those few persons who resorted to him as their confessor and prophet, and knew the deep value of his mind and great heart. (9) He thought that without religion or devotion of some kind nothing great was ever accomplished; and he thought that the bigoted sectarian had better bear this in mind. His virtues, of course, sometimes ran into extremes. It was easy to trace to the inexorable demand in all for exact truth that austerity which made this willing hermit more solitary even than he wished. Himself of a perfect probity, he required not less of others. He had a disgust at crime, and no worldly success could cover it. He detected paltering as readily in dignified and prosperous persons as in beggars, and with equal scorn. Such dangerous frankness was in his dealing that his admires called him “that terrible Thoreau,” as if he spoke when silent, and was still present when he had departed. I think the severity of his ideal interfered to deprive him of a healthy sufficiency of human society. Had his genius been only contemplative, he had been fitted to his life, but with his energy and practical ability he seemed born for great enterprise and for command; and I so much regret the loss of his rare powers of action, that I cannot help counting it a fault in him that he had no ambition. (10*) Wanting this, instead of engineering for all America, he was the captain of a huckleberry party. Pounding beans is good to the end of pounding empires one of these days; but if, at the end of years, it is still only beans! There is a flower known to botanists, one of the same genus with our summer plant called “Life-Everlasting,” a Gnaphalium like that, which grows on the most inaccessible cliffs of the Tyrolese mountains, where the chamois dare hardly venture, and which the hunter, tempted by its beauty, and by his love, (for it is immensely valued by the Swiss maidens,) climbs the cliffs to gather, and is sometimes found dead at the foot, with the flower in his hand. It is called by botanists the Gnaphalium leontopodium, but by the Swiss Edelweisse,(11) which signifies Noble Purity. Thoreau seemed to me living in the hope to gather this plant, which belonged to him of right. The scale on which his studies proceeded was so large as to require longevity, and we were the less prepared for his sudden disappearance. The country knows not yet, or in the least part, how great a son it has lost. It seems an injury that he should leave in the midst his broken task, which none else can finish, — a kind of indignity to so noble a soul, that it should depart out of Nature before yet he has been really shown to his peers for what he is. But he, at least, is content. His soul was made for the noblest society; he had in a short life exhausted the capabilities of this world; wherever there is knowledge, wherever there is virtue, wherever there is beauty, he will find a home. On the day that the revolutionary abolitionist John Brown was hanged for treason, Henry David Thoreau, author of On Civil Disobedience, offered a passionate eulogy in praise of him, while others burned Brown in effigy outside. The following essay was written shortly thereafter. For an account of Brown’s visits to Concord and his relationships with Thoreau, Ralph Waldo Emerson, and other Transcendentalists, click here. For my own part, I commonly attend more to nature than to man, but any affecting human event may blind our eyes to natural objects. I was so absorbed in him as to be surprised whenever I detected the routine of the natural world surviving still, or met persons going about their affairs indifferent. It appeared strange to me that the “little dipper” should be still diving quietly in the river, as of yore; and it suggested that this bird might continue to dive here when Concord should be no more. The order of instructors was reversed. I heard that one preacher, who at first was shocked and stood aloof, felt obliged at last, after he was hung, to make him the subject of a sermon, in which, to some extent, he eulogized the man, but said that his act was a failure. An influential class-teacher thought it necessary, after the services, to tell his grown-up pupils that at first he thought as the preacher did then, but now he thought that John Brown was right. But it was understood that his pupils were as much ahead of the teacher as he was ahead of the priest; and I know for a certainty that very little boys at home had already asked their parents, in a tone of surprise, why God did not interfere to save him. In each case, the constituted teachers were only half conscious that they were not leading, but being dragged, with some loss of time and power. The more conscientious preachers, the Bible men, they who talk about principle, and doing to others as you would that they should do unto you–how could they fail to recognize him, by far the greatest preacher of them all, with the Bible in his life and in his acts, the embodiment of principle, who actually carried out the golden rule? All whose moral sense had been aroused, who had a calling from on high to preach, sided with him. What confessions he extracted from the cold and conservative! It is remarkable, but on the whole it is well, that it did not prove the occasion for a new sect of Brownites being formed in our midst. Most Northern men, and a few Southern ones, were wonderfully stirred by Brown’s behavior and words. They saw and felt that they were heroic and noble, and that there had been nothing quite equal to them in their kind in this country, or in the recent history of the world. But the minority were unmoved by them. They were only surprised and provoked by the attitude of their neighbors. They saw that Brown was brave, and that he believed that he had done right, but they did not detect any further peculiarity in him. Not being accustomed to make fine distinctions, or to appreciate magnanimity, they read his letters and speeches as if they read them not. They were not aware when they approached a heroic statement, — they did not know when they burned. They did not feel that he spoke with authority, and hence they only remembered that the law must be executed. They remembered the old formula, but did not hear the new revelation. The man who does not recognize in Brown’s words a wisdom and nobleness, and therefore an authority, superior to our laws, is a modern Democrat. This is the test by which to discover him. He is not willfully but constitutionally blind on this side, and he is consistent with himself. Such has been his past life; no doubt of it. In like manner he has read history and his Bible, and he accepts, or seems to accept, the last only as an established formula, and not because he has been convicted by it. You will not find kindred sentiments in his commonplace book, if he has one. When a noble deed is done, who is likely to appreciate it? They who are noble themselves. I was not surprised that certain of my neighbors spoke of John Brown as an ordinary felon, for who are they? They have either much flesh, or much office, or much coarseness of some kind. They are not ethereal natures in any sense. The dark qualities predominate in them. Several of them are decidedly pachydermatous. I say it in sorrow, not in anger. How can a man behold the light who has no answering inward light? They are true to their right, but when they look this way they see nothing, they are blind. For the children of the light to contend with them is as if there should be a contest between eagles and owls. Show me a man who feels bitterly toward John Brown, and let me hear what noble verse he can repeat. He’ll be as dumb as if his lips were stone. Editors persevered for a good while in saying that Brown was crazy; but at last they said only that it was “a crazy scheme,” and the only evidence brought to prove it was that it cost him his life. I have no doubt that if he had gone with five thousand men, liberated a thousand slaves, killed a hundred or two slaveholders, and had as many more killed on his own side, but not lost his own life, these same editors would have called it by a more respectable name. Yet he has been far more successful than that. He has liberated many thousands of slaves, both North and-South. They seem to have known nothing about living or dying for a principle. They all called him crazy then; who calls him crazy now? All through the excitement occasioned by his remarkable attempt and subsequent behavior the Massachusetts Legislature, not taking any steps for the defense of her citizens who were likely to be carried to Virginia as witnesses and exposed to the violence of a slaveholding mob, was wholly absorbed in a liquor-agency question, and indulging in poor jokes on the word “extension.” Bad spirits occupied their thoughts. I am sure that no statesman up to the occasion could have attended to that question at all at that time–a very vulgar question to attend to at any time! The death of [Washington] Irving, which at any other time would have attracted universal attention, having occurred while these things were transpiring, went almost unobserved. I shall have to read of it in the biography of authors. Literary gentlemen, editors, and critics think that they know how to write, because they have studied grammar and rhetoric; but they are egregiously mistaken. The art of composition is as simple as the discharge of a bullet from a rifle, and its masterpieces imply an infinitely greater force behind them. This unlettered man’s speaking and writing are standard English. Some words and phrases deemed vulgarisms and Americanisms before, he has made standard American; such as “It will pay.” It suggests that the one great rule of composition–and if I were a professor of rhetoric I should insist on this–is, to speak the truth. This first, this second, this third; pebbles in your mouth or not. This demands earnestness and manhood chiefly. We seem to have forgotten that the expression, a liberal education, originally meant among the Romans one worthy of free men; while the learning of trades and professions by which to get your livelihood merely was considered worthy of slaves only. But taking a hint from the word, I would go a step further, and say that it is not the man of wealth and leisure simply, though devoted to art, or science, or literature, who, in a true sense, is liberallyeducated, but only the earnest and free man. In a slaveholding country like this, there can be no such thing as a liberal education tolerated by the State; and those scholars of Austria and France who, however learned they may be, are contented under their tyrannies have received only a servile education. Nothing could his enemies do but it redounded to his infinite advantage–that is, to the advantage of his cause. They did not hang him at once, but reserved him to preach to them. And then there was another great blunder. They did not hang his four followers with him; that scene was still postponed; and so his victory was prolonged and completed. No theatrical manager could have arranged things so wisely to give effect to his behavior and words. And who, think you, was the manager? Who placed the slave-woman and her child, whom he stooped to kiss for a symbol, between his prison and the gallows? We soon saw, as he saw, that he was not to be pardoned or rescued by men. That would have been to disarm him, to restore to him a material weapon, a Sharps’ rifle, when he had taken up the sword of the spirit–the sword with which he has really won his greatest and most memorable victories. Now he has not laid aside the sword of the spirit, for he is pure spirit himself, and his sword is pure spirit also. What a transit was that of his horizontal body alone, but just cut down from the gallows-tree! We read, that at such a time it passed through Philadelphia, and by Saturday night had reached New York. Thus like a meteor it shot through the Union from the Southern regions toward the North! No such freight had the cars borne since they carried him Southward alive. On the day of his translation, I heard, to be sure, that he was hung, but I did not know what that meant; I felt no sorrow on that account; but not for a day or two did I even hear that he was dead, and not after any number of days shall I believe it. Of all the men who were said to be my contemporaries, it seemed to me that John Brown was the only one who had not died. I never hear of a man named Brown now–and I hear of them pretty often–I never hear of any particularly brave and earnest man, but my first thought is of John Brown, and what relation he may be to him. I meet him at every turn. He is more alive than ever he was. He has earned immortality. He is not confined to North Elba nor to Kansas. He is no longer working in secret. He works in public, and in the clearest light that shines on this land. By signing the Guarantee Living-Wage Job Opportunities petition, you can support the growing momentum to affirm the human right to a decent job. To sign, click here. When one supporter signed, she commented, “Yes! I have been unemployed for over a year and am losing my home, marriage and dignity!” Let’s keep her in mind, as well as others like her and everyone faced with a similar threat, as we move to achieve genuine full employment. We need to expand our network of concerned individuals so we can keep each other informed about opportunities for action! In week two, the number of people signing the petition more than doubled to a total of 112. We need to continue that growth. One signer, Justin Talbot Zorn, is helping to organize a February 5 public forum in Washington, DC on “Employment: A Human Right” with Representatives John Conyers and Frederica S. Wilson. Another signer, Phil Harvey, is on the panel, as is the economist Dean Baker, who has contributed greatly to our campaign. The Coalition of Immokalee Workers recently persuaded Walmart to join the Fair Food Program, which aims to improve farmworkers’ wages and working conditions. On January 15, the National Labor Relations Board’s general counsel filed a formal complaint against Walmart for taking illegal retaliation against Walmart workers in 14 states. The day earlier, a U.S. District Court Judge reaffirmed an earlier decision that a class-action lawsuit against Walmart can go forward. More than 130,000 individuals have signed the OUR Walmart petition asking President Obama to support Walmart workers who are risking their livelihood by organizing fellow workers. Fast-food workers organizing with Restaurant Opportunities Centers have prompted business groups to undertake counter-measures. Please sign their petition to increase the minimum wage. Underlying these efforts is the universal human right to a living-wage job opportunity. We can’t guarantee everyone a job; some people will be unwilling or unable to work. But we can guarantee the opportunity. Most Americans want the government in Washington to see to it that everyone who wants to work can find a living-wage job. We need powerful, popular pressure to persuade Congress to honor the will of the people. So please sign our petition and follow us on Twitter at @LivingWageJobs. Makes sense to me. If you haven’t seen it yet, you might be interested in the work of Robert Pollin (progressive economist at U Mass) on living wage and how to achieve it. It’s an excellent article. While it’d be good to bring it down to about 750 (classic op-ed length), not essential. After carefully reviewing, I feel that every sentence has some unique value. I especially like the way you take on the conservative counter-arguments directly. Economists can’t come up with the right answers unless they are asked the right questions. In this brief article Wade Lee Hudson reminds us that the question we really need answered is not how low we can push the unemployment rate before inflation rates begin to rise, but how to insure the availability of enough jobs to provide decent work for everyone who wants it. If more people beat this particular drum, maybe the economics profession would begin to listen. Looks good to me. Good luck with it. Securing the right to living-wage employment would have an enormous, positive impact on our society. The ripple effects would be powerful. Everyone would benefit. We can easily achieve this goal and there is no good reason not to do it. All we need is for those who support this cause to do what they can to advance it.